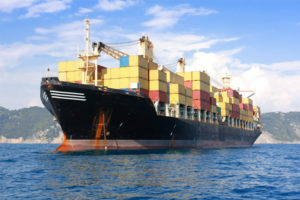 The spot container freight rates on key routes from Asia to the ports of northern and southern Europe showed a slight increase last week, while the rates on services through the Pacific Ocean continue to decline. Thus, the value of the Shanghai Containerized Freight Index (SCFI) for the routes from China to the ports of northern Europe increased by 3.6% at the end of last week to 866 USD per TEU, while the index rates for the Mediterranean ports grew by 1.2% to 827 USD per TEU. However, the current rates from Asia to Europe are about 20% lower than at the beginning of the year. Spot rates for transportation from Asia through the Pacific Ocean continued to decline. The value of the SCFI index on the ports of the western coast of the United States decreased over the past week by another 1.3% to 1,357 USD per FEU, as the decrease since the beginning of the year exceed 38%. The spot freight rates towards the ports of the US East Coast fell by 3.1% to 2,360 EUR per FEU, which is 34% below the level of the beginning of the year. Meanwhile, the spot container freight rates from China to Persian Gulf and Red Sea decreased by 4.3% to 847 USD per TEU, while the rates to Australia decreased by 2.5% to 430 USD per TEU. Rates on all major transportation routes, except for the east coast of the United States, increased significantly in the last week of March, which was partly due to the launch of a new system of global carriers’ alliances from April 1.